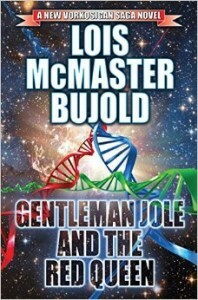 In which Tansy & Alex take apart the joyous wonder that is the latest Lois McMaster Bujold novel: Gentleman Jole & the Red Queen. You can get us from iTunes or at Galactic Suburbia. Oliver Jole as unusual male hero: how often do we see books about men choosing between career advancement and having children? Is Miles ‘the man’ now? Does he represent conservative Barrayar, or is there still a healthy rebellious Betan streak in him? The sciencey science of a colonised planet: Sergyar needs marine biologists and plumbers more than soldiers and politicians! Reader response: what was problematic, unrealistic expectations, what does a Vorkosigan novel look like anyway? We love you all and we love this book: only listen to this episode if you genuinely don’t mind being spoiled for all the things. PS: Tansy still maintains that the Vorkosigan saga is just fine read in random book order. Alex is not okay with this. Follow your own instincts on this one. You can Skype us to leave a short message about any of our topics or episodes, to be included in a future show. Otherwise, please send feedback to us at galacticsuburbia@gmail.com, follow us on Twitter at @galacticsuburbs, check out Galactic Suburbia Podcast on Facebook, support us at Patreon and don’t forget to leave a review on iTunes if you love us! Galactic Suburbia on Patreon Throw money at GS! Cool rewards for everyone!